These spicy seasoned pretzels are an easy homemade snack great for dipping in hummus, guacamole or just eaten by themselves and easily adjusted to your taste! I never used to be a salty-craving kind of person. Chips? Eh. Fries? Good but not chocolate. Pretzels? Ha, not even worth a second glance. But lately, that’s all changed. Don’t get me wrong, I am still very firmly planted in dessert world. My affinity for something sweet (specifically pie and chocolate) hasn’t waned, I’ve just oddly become more and more into salty snack foods this summer (this made for a trying bathing suit season to say the least). *This post is sponsored by partner, Sabra. All content and opinions are my own. In a previous life I could sit in front of a bowl of chex mix and not be tempted in the least to stick my hand in there for even one taste. Today, I’d probably pick the pretzels out one by one until the bowl was left with just the cereal, breadsticks, crackers and whatever else is in that weird party snack. I seriously can’t stop eating pretzels lately. From those addicting AF honey-wheat braided stick ones to these fun “waffle” shaped square ones and every pretzel in between, I think I’ve eaten them all this summer. My newest obsession? 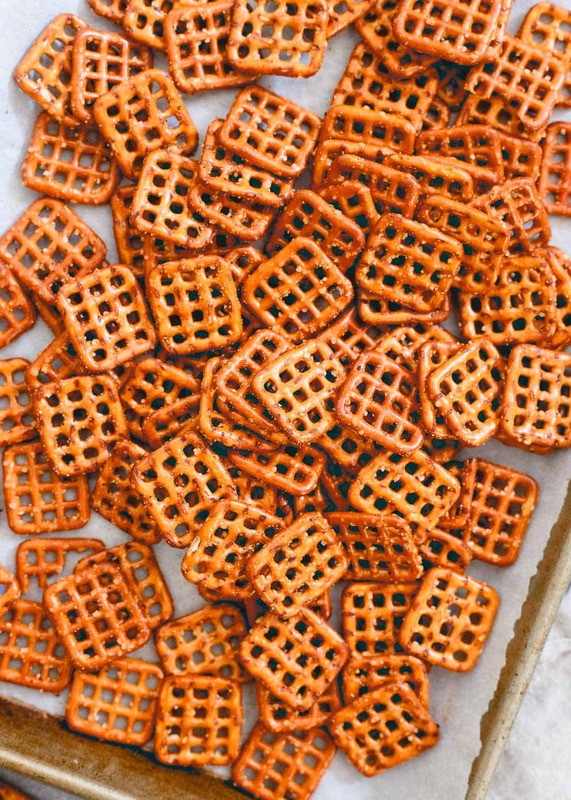 Turning them into my own sort of chex mix with these baked spicy seasoned pretzels. The thing about salty snacks that I’m loving lately is mostly the savory spices that often accompany them. So, combining that element with pretzels in a homemade version where I can control the seasoning pretty much makes these spicy seasoned pretzels my ideal snack. Only made better by dipping in some Sabra guacamole. 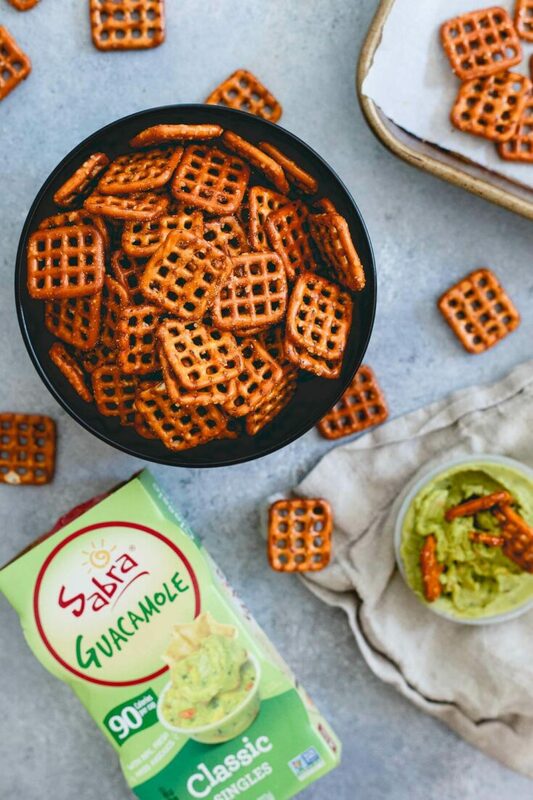 Perfect timing for back to school lunchbox packing –> these spicy seasoned pretzels + Sabra singles guacamole. 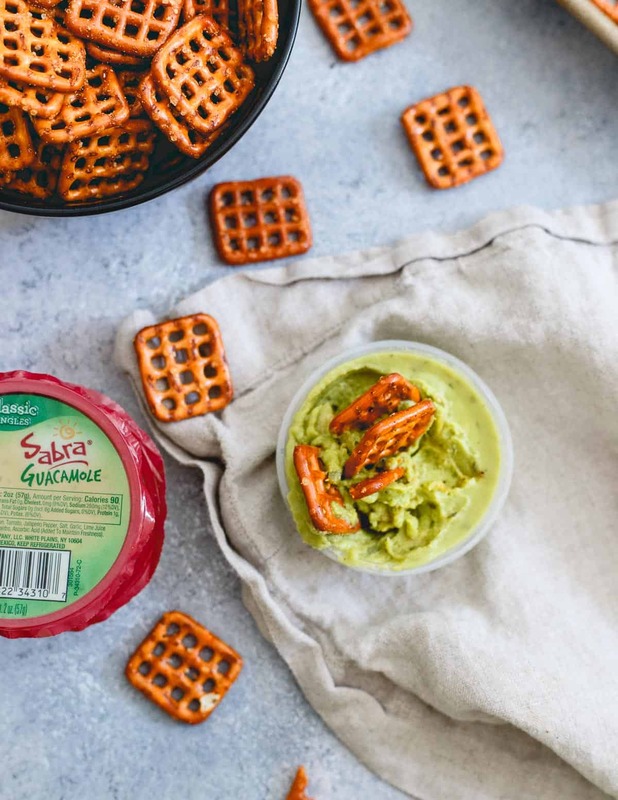 I’m partial to the classic guacamole right now (90 cals, made with Haas avocados) and pretty much exclusively munch on this combo every day for lunch or an afternoon snack, but Sabra hummus singles (which come in classic and roasted red pepper) are a great option for dipping too. I love the portion control of the singles (because we all know how easy it is to eat an entire container of guac or hummus) and they lend themselves so well to throwing in your kid’s (or husband’s in my case) lunch box (ok, I don’t really pack his lunch, I just strongly suggest options when he’s standing there in front of the fridge for 10 minutes). Grab a coupon for $2 off any Sabra singles –> click here. Love this spicy seasoned pretzels recipe? Try Roasted Chickpeas (or the dessert version with these cinnamon toast crunch roasted chickpeas), Citrus Herb Jicama Chips or, Pizza Kale Chips. 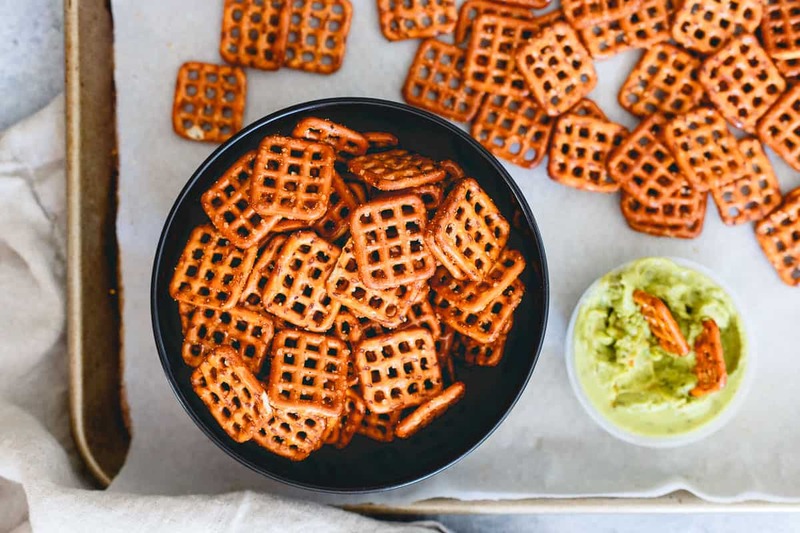 These spicy seasoned pretzels are an easy homemade snack great for dipping in hummus, guacamole or, eaten by themselves and easily adjusted to your taste! Combine all ingredients in a large bowl and mix with a spatula until all the pretzels are evenly coated with the oil and spices. Spread out onto a baking sheet in a single layer. Bake pretzels for 45 minutes, tossing a few times during baking. Remove from oven, let cool completely. Store in an airtight bag. Recipe is easily doubled (or more) to make a bigger batch. These keep well in a plastic zipped bag for a week or more. Sounds like a great snack to pair with hummus or guac! Ooooh yes! I am a pretzel fiend as it is, but these look downright addictive. Can’t wait to try them! I’m a serious salty snack girl so I love this recipe. I could eat my weight in these pretzels.